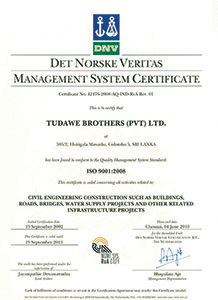 "Achieving recognition from the institute that understands construction"
Tudawe Brothers is the first local construction company in Sri Lanka to hold the prestigious ISO 9002 quality system standard for Building Construction and the Manufacture of Ready Mixed Concrete. 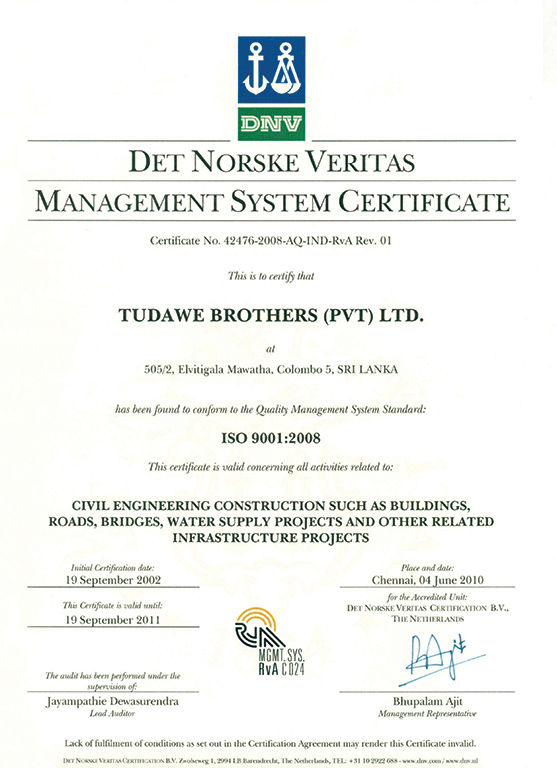 This was conferred by DNV (DET NORSKE VERITAS) and accredited by the RvA for Building Construction and Manufacture of Ready Mixed Concrete in 1998. The Company is presently certified under ISO 9001:2008 for Civil Engineering Construction such as construction of buildings, roads, bridges, water supply projects and other related infrastructure projects, marketing, manufacture and supply of ready mixed concrete, quarry products, aggregates and asphalt concrete.